Do team members know what is expected of them? How can each team member contribute most effectively? What constants hold the team together? Consistent application of the 10 rules of high performance teamwork ultimately generates trust, respect, unity and power within any team. Enjoy this short movie that reinforces teamwork through Lessons from Geese. •The ultimate book on teamwork by the ultimate team. •You will be amazed how the same teamwork principles used by the Blue Angels will apply directly to you and your business. •Breathtaking photography and graphic design, make the messages within this book leap right off the pages. •Use as a corporate theme to get your business or organization operating at peak performance levels. Get your team ready for peak performance when you apply the nine principles of teamwork used by the Blue Angels. No pilot license needed -each principle ties back to what it means to your company and your team.Learn how to Build Team Work. This beautifully designed gift book written by Blue Angel pilot, Scott Beare and award-winning designer Michael McMillan, will "knock your socks off." The Power of Teamwork is filled with great stories and great graphics are used to reinforce the nine key principles of teamwork used by the Blue Angels. And, each principle ties back to what it means to your company and your team. When your definitions of teamwork align with those of the Blue Angels, you are really ready for peak performance. This is a great book for every person in your organization to truly grasp the power of teamwork. 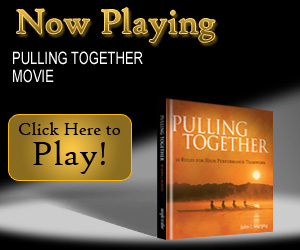 Play this movie at your next team meeting and give a copy to each member to drive home the message. Wisdom of Wolves w/Free Dvd •"For the strength of the Pack is the Wolf, and the strength of the Wolf is the Pack." - Rudyard Kipling •What would happen in our business and our personal lives if we worked together towards a common goal like the wolf pack works together for survival? •Explore the characteristics of this majestic creature in this breathtaking inspiring book. •A perfect book for your next leadership retreat. Twyman became interested in wolf packs after a grueling consulting project where the corporation he was working with had a group of executives trying to one-up one another and were generally stabbing each other in the back to get ahead. When he turned on public television that night he was transported to a different world, the milieu of the wolf pack, where teamwork, loyalty and communication were the norm rather than the exception. Learn how to Build Team Work. Twyman Towery, Ph.D., a professional speaker and consultant who studied the lessons of leadership in nature and has captured them in a new book for Simple Truths called the Wisdom of Wolves. Twyman shares the parallels between the wolf pack and human behavior…in business, the family and how it impacts your personal life. Sample of chapters: Teamwork, patience, unity, failure, attitude, communication, play, loyalty and change are just a few of the subjects covered in this beautiful book. Each chapter closes with "Questions to Ponder" that relate back to your own business, family and personal life. A great tool for leadership meetings and retreats in any type of organization. Wisdom of Wolves is one of the most fascinating books you will ever read and the the images of wolves captured in this book will take your breath away.